For me, Donald Trump is a real threat to religious harmony and peace in the world. When Donald Trump first proposed that Muslims be banned from the United States, I was horrified. He couldn’t be serious, I thought. Not only was his proposal obviously unconstitutional, it was ignorant of the long history of Muslims in the United States. Muslims are part of the unfolding story that is America. Trump cannot erase them from American history. Nor can he delete the historical fact that the first country to recognize the United States was the Sultanate of Morocco in 1777 under Sultan Mohammed Ben Abdellah al-Khatib. Trump has made Islamophobia acceptable in the United States. His fear of Muslims is a hysterical reaction to terrorism, which Muslims reject and Islam forbids. I understand this because I live and work in an Islamic society. Donald Trump knows nothing about Islam and Muslims and his hateful rhetoric reflects his ignorance. Has he ever read Ibn Khaldun or Naguib Mahfouz? The Muslim world is rich in history, diversity and culture. For the past dozen years, I have experienced the vast Muslim world up close through work and travel, and I can honestly say that Donald Trump’s views on Muslims bear no resemblance to reality. I was so pleased to hear Khizr Khan challenge Donald Trump at the Democratic National Convention. It was a powerful moment for Americans to witness. Islamophobia and bigotry must be challenged, and the bigger the audience, the better. Khizir Khan needn’t have asked Trump if he had read the Constitution because we all know the answer. What bothers me about Trump is how he has tarnished America’s reputation all over the world. His bigoted statements and threats to Muslims do not represent America or its values. He is a frightening outsider – a bully with a Twitter account. On my recent trip to Morocco, everyone I met wanted to talk about Donald Trump. How could Americans support his divisive campaign, they wondered? I wish I had an answer for them. I am mystified at his popularity, but confident he will be defeated in November. The Trump moment in America will pass. History is the best teacher. There have been many demagogues in American history, who have railed against Catholics, Jews, Germans, Italians, Irish and other groups. These demagogues became reviled footnotes in the history of the United States. Prejudice is not celebrated in America, and it surely is not what our country is about. This is the message I give my Muslim friends. -Joseph Richard Preville is Assistant Professor of English at Alfaisal University/Prince Sultan College of Business in Jeddah, Saudi Arabia. 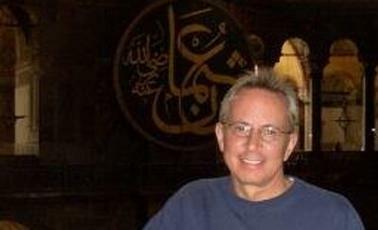 His work has appeared in The Christian Science Monitor, San Francisco Chronicle, Harvard Divinity Bulletin, Tikkun, The Jerusalem Post, Muscat Daily, Saudi Gazette, Informed Comment and World Religion News.